Mr Foreman tells us that of Potter's pupils at the Royal Academy in London, Sterndale Bennett was the most successful. He was born in Sheffield but brought up in Cambridge. The Op. 43 symphony was written in splendid isolation in the 1860s after a quartet of symphonies were completed by him in the 1830s. This same period also saw the piano concertos - all recorded years ago on Lyrita and still available from Harold Moores. The 1867 Symphony sounds rather like Schubert with infusions of Weber. It shivers and bristles with lovely effects including superb antiphonal dialogue from first and second violins split by Bostock right and left - Boult and Handley-style. There is some exciting writing for the horns which looks forward well into the new century to Stanford's Second Piano Concerto. In the two outer movements it is also possible to discern the rather tense and eager romanticism of Parry's neglected� First Symphony. In its first movement it has the harried overcast angst of Schubert's Unfinished Symphony. The following Minuetto is relaxed apart from some not very stern admonitions from the brass. The third movement has a Dvoř�kian pastoral lilt which continues with pattering delight into the Mendelssohn-style Intermezzo. Sturm und Drang shakes the rafters of the Rondo finale which again displays Mendelssohnian traits alongside great draughts of 'the grand manner' from Schubert 9. Indeed the Great C major is bound to be in your mind as you hear the closing pages. Both of these nineteenth century British symphonies are performed with �lan and doughty style. Where ClassicO have lead the way it would not surprise me if CPO were to follow. Oh and by the way, if you were wondering, Vol. 13 was the first two Alan Bush symphonies. 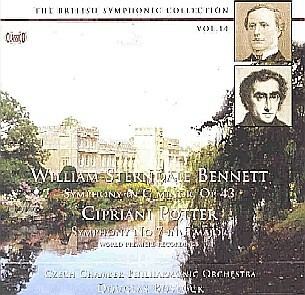 Just wanted to point out that this is not the first recording of Potter symphonies as Rob Barnett seems to suggest - the Milton Keynes Chamber Orchestra recorded two of them in the 1980s. That is one of my favourite disks (unfortunately now no longer available) and in my view shows Potter to be a very good symphonist. There are very few British composers that we know about in this period and I will certainly be getting this latest release.